Cloned from Monkey by Elementalist. See also Zodiac Square by Elementalist, SlackBauer by Elementalist. Info: Created on 1st March 2012 . Last edited on 22nd October 2013. Big update 7/10/2012; all Latin Extended-B characters are here now. Fitting them into a width of at most 6 pixels was challenging, and it shows on a few of the more ridiculous glyphs (Do we really need DZ as one glyph? Maybe the monospacing justifies it, though the widest glyphs still have no gap between them and the next one.). I am fairly proud of the curls on some of these though. Feel free to clone and see for yourself! And here's a sample with some of the new glyphs. I like this font. I shall use it in my game: "Pangolin Kwest". My thanks to you, good sir. 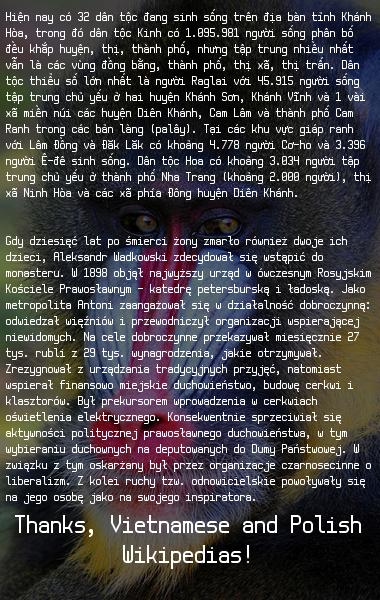 Here's a revised sample just to show off Polish and Vietnamese language support. Same photo, same credit as before. UPDATE: Hooks over Vietnamese letters now look less like grave accents. Congratulations! FontStruct Staff have deemed your FontStruction worthy of special mention. “Mandrill” is now a Top Pick. Hooray, a Top Pick! I've been using Mandrill more often this year than during 2012 (when I worked on it), and I have noticed that I have really gotten used to some of the properties of the font. If you only use ASCII, it pretty much has a higher line-height and some squashed lower-case letters ('s' is a little weird, but I don't notice it in prose anymore). The nice thing is that most of the other Latin-something glyphs blend smoothly with the ASCII; Icelandic users might appreciate having a narrow monospaced font with an æ that is still legible at size 12, I think most Eastern European languages can use this, and Vietnamese... well it looks really good at size 24/32 (depending on the program), and the hook above diacritic looks like the logical not sign '¬' at size 12/16. Still, I am fairly sure that a Vietnamese-proficient reader with sharp enough vision and a screen that doesn't shrink pixels (Retina displays might be good or bad at this) could adapt to the 2-3-pixel difference between 'ỏ' and 'ó', but I need to confirm this with someone who can read the language. 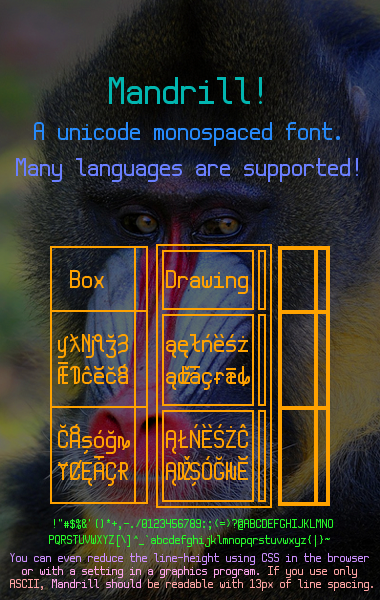 I learned a lot working on Mandrill, and I hope someone finds it useful -- for Vietnamese, Swedish, Croatian or English! Hi by mistake I think I've cloned your character, I do not know whether to delete it also eliminates your work so for now don't touch and don't delete it. One question, since I love your style and I see that the license is in the public domain before anyway to act, I wanted to ask you can use your fonts for commercial purposes? I don't intend to sell your fonts, but to let you know I mean for example create a logo and sell it, or even another example create video game buttons, type Start, game over, Coins, Score Etc, once created these buttons mean to use your font, as text for the buttons. You're okay with this, or are there any restrictions? Hello! and sorry for my English I am using a translator. Hi I wanted to ask you can use your font for commercial use? Are there any restrictions? For example, If I use your font to create graphics and after the sell you can do it or not? I do not intend to sell your font, but create assets such as ' Start ' button ' game over ' etc. You can use this font for whatever you need, LucaWeb. The license allows you to do anything with this font and you don't need to mention me (it's free and you can do what you want with it). I should suggest looking at other fixed-width fonts that are also free and have a somewhat similar appearance to Mandrill, like Iosevka and Monoid. Mandrill looks good at specific sizes, but those two fonts I linked will scale to many sizes, and have bold and italic styles as well. I'm glad you like Mandrill, though! It will probably look more crisp at a small size like 12pt than those two linked fonts. Public Domain and Esperanto support! Cannot like this enough.